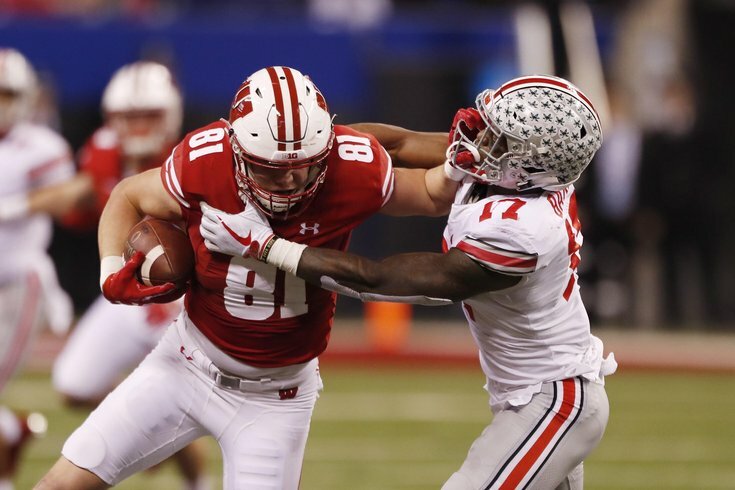 Wisconsin TE Troy Fumagalli would make sense for the Eagles on Day 3 of the 2018 NFL Draft. Over the next couple of weeks, we'll be taking a look at each of the Philadelphia Eagles' positional groups. We'll determine if the Eagles are likely to select a player at that position with one of their six picks in the 2018 NFL Draft, as well as note some players who make sense. This offseason, at the tight end position, the Eagles lost Trey Burton in free agency and released Brent Celek to save $4 million in cap space. Obviously, Burton and Celek are survived by one of the best receiving tight ends in the NFL in Zach Ertz. To try to plug a hole with an experienced tight end, the Eagles signed former Packers TE Richard Rodgers to a veteran minimum contract, and he'll have to earn his way onto the team. The tight end class is thought to be a strong group this year, which both Howie Roseman and Doug Pederson stated at the NFL Combine. Goedert has been a popular player to appear as the Eagles' pick in mock drafts, which I had previously disagreed with on the premise that any No. 2 tight end isn't going to see the field enough to warrant a first round pick. Should we really be thinking of the Eagles' first round pick as "a first round pick," or as "the 32nd overall pick?" By that I mean, let's say the Eagles had the third- and 35th-overall picks in the draft. Would you bat an eye at him being selected 35th? The reality is that the Eagles don't have a premium pick in this draft, because, well, they won the Super Bowl. It's one pick away from being a second-round pick. The most successful teams in the NFL get it done in the red zone. In fact, the top three teams in red zone efficiency last season were the Eagles, Patriots, and Jaguars. I think we can agree all three of those teams had good seasons in 2017. Goedert could be a matchup nightmare for opposing defenses, who already have to contend with covering Alshon Jeffery and Ertz. If Goedert ends up being that good, then just keep him on the field. If there's one thing that Doug Pederson has proven he is great at, it's forming his offensive schemes around the personnel in place. Fumagalli is more of a well-rounded tight end than some of the guys below. He's a willing blocker, but not quite as good in that respect because he's skinny for the position, at 6'6, 248. Smythe's college production wasn't exactly all that impressive. By comparison, as noted above, Goedert had 164 catches for 2404 yards and 18 TDs. BUT... Smythe is very good blocker, and could seamlessly fill the role vacated by Brent Celek. Here's a cut-up of Smythe against LSU last season. There are a couple receptions thrown in (he can catch, despite the numbers above), but focus on his blocking. I believe Smythe can become a much better receiver in an Eagles offense that has a strong running game and no shortage of weapons in the passing game. Herndon is an athletic but raw tight end with modest production (1048 career receiving yards). Herndon would be more of a long-term answer as the team's second tight end, but has more upside than most of the guys noted here. Herndon was also one of the Eagles' reported 30 allotted visits this offseason. And again, Brent Celek comparison alert -- Izzo has extreme willingness (and ability) to block, as well as a yards after catch style of trying to dish out punishment when he has the ball in his hands. He would be a nice complementary "Y" tight end to Zach Ertz.